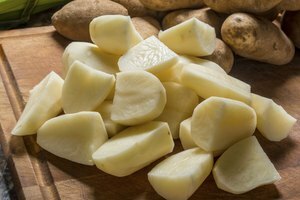 Proper packaging and temperature regulation are the most vital aspects of refrigerating cooked potatoes. Wrapping the potatoes or potato dish effectively protects the spuds from illness-causing bacteria and the odors of other foods, which porous potatoes will readily absorb if exposed. Regulating temperature is also critical because bacteria grow rapidly between 40 and 140 degrees Fahrenheit. 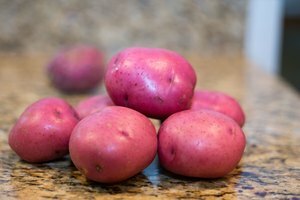 Quick-cooling potatoes and maintaining a refrigerator temperature below 40 F inhibits illness-causing organisms from contaminating your cooked tubers. Some of the techniques and tools you employ when you cook potatoes affect how well they withstand refrigeration. Cook potatoes in stainless steel cookware or other nonreactive pots and pans. Cooking them in aluminum or iron pots increases the likelihood of after-cooking discoloration. 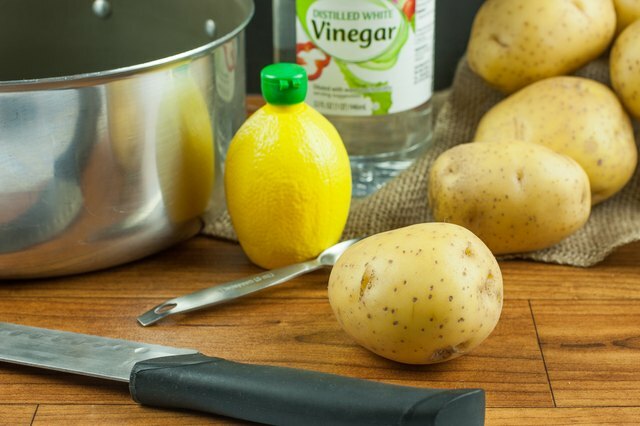 Add about 1 teaspoon of white vinegar or lemon juice to a pot of water if you are blanching, parboiling or boiling potatoes for future use in a dish such as potato salad or mashed potatoes. The acidity of vinegar and lemon juice helps prevent after-cooking discoloration. A small volume should not alter the flavor of the potatoes. Drain the spuds after cooking them. 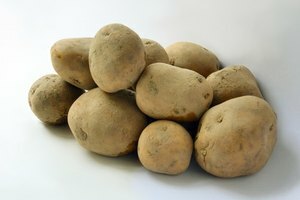 Storing cooked potatoes in water can cause them to become waterlogged. Quick-cool cooked potatoes in an ice-water-filled sink until they are 40 F according to a food thermometer. 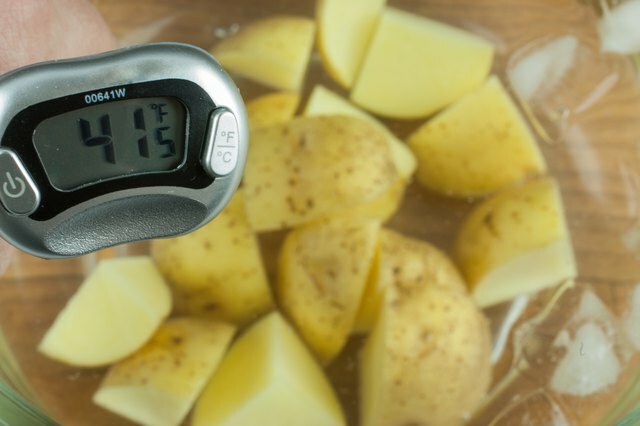 Placing hot food in a refrigerator or freezer temporarily raises the temperatures of the nearby foods, potentially placing them in the temperature “danger zone” between 40 and 140 F. Divide a large volume of potatoes into smaller portions before quick-cooling the potatoes so they cool more quickly. Package cooked potatoes in moisture-vapor-resistant plastic containers with tight-fitting lids or resealable plastic bags designed for food storage. 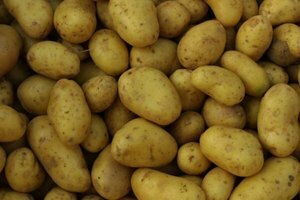 Moisture-vapor-resistant packaging protects the potatoes from oxygen -- which could discolor them, along with illness-causing bacteria and odors from other foods. 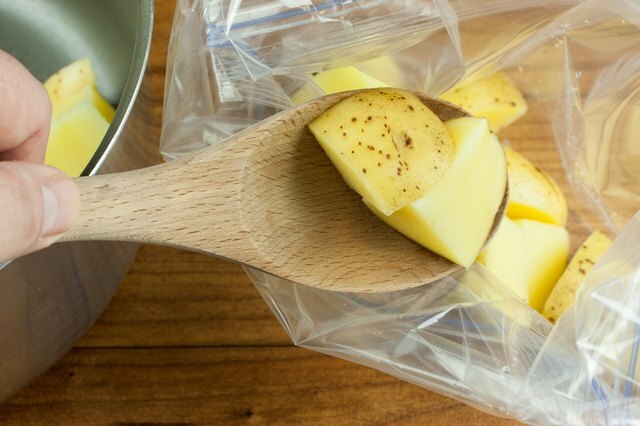 Choose a rigid plastic container if the potatoes have a sauce or broth -- liquid can be difficult to pour into and out of plastic bags. Avoid aluminum foil storage materials, which may cause the potatoes to discolor. Foil-wrapped baked potatoes have been linked to cases of botulism, according to the Centers for Disease Control and Prevention. Botulism spores can survive the cooking process. 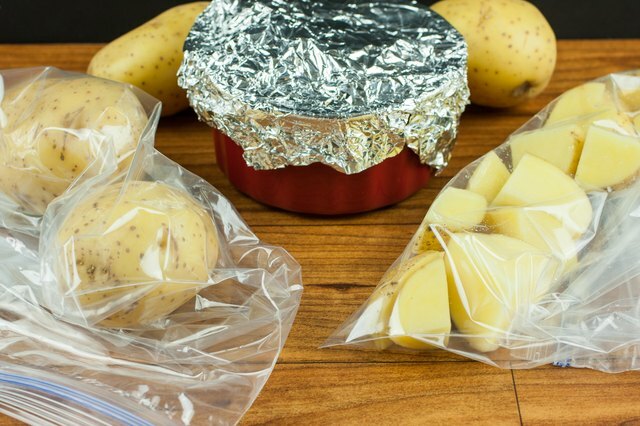 Oxygen prevents botulism from growing on other potato dishes such as roasted or mashed potatoes, but foil-wrapped potatoes are not exposed to air. 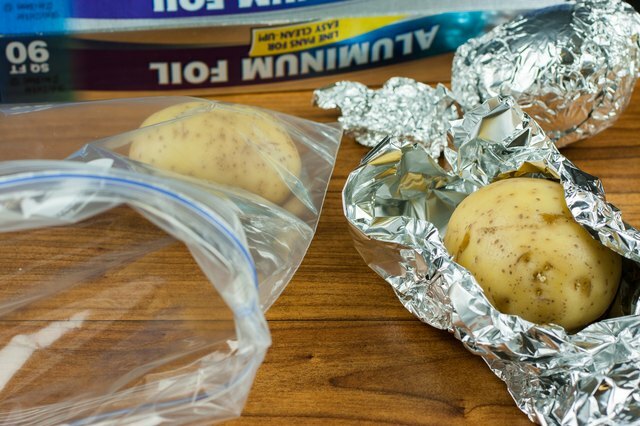 Remove the foil from foil-wrapped baked potatoes, quick-cool them and place them in plastic storage materials immediately after removing them from the oven. Transfer them to the refrigerator right away to inhibit the growth of botulism spores. 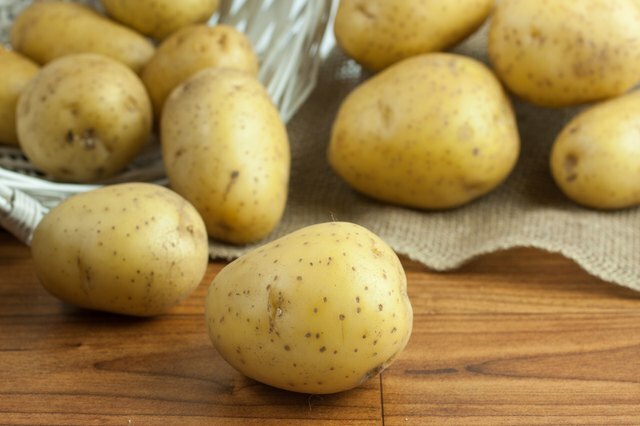 Refrigerate cooked potatoes below 40 F. Keep plain potatoes in a refrigerator up to 1 week; keep potato dishes that contain meat or dairy products up to 5 days. Consume potatoes within 2 days for the best results. Reheat warm potato dishes at 350 F until they reach internal temperatures of 165 F to ensure food safety.